Consistent quality control in color-critical product categories is finally possible thanks to the SpectraLight QC light booth. This holistic visual color assessment system features state-of-the-art light sources, including natural filtered daylight, making it easy to meet practically any specification. A data-driven back-end ensures inter-instrument agreement across the supply chain, allowing unprecedented reporting and traceability on unit settings, lamp performance, operator certifications, and more. 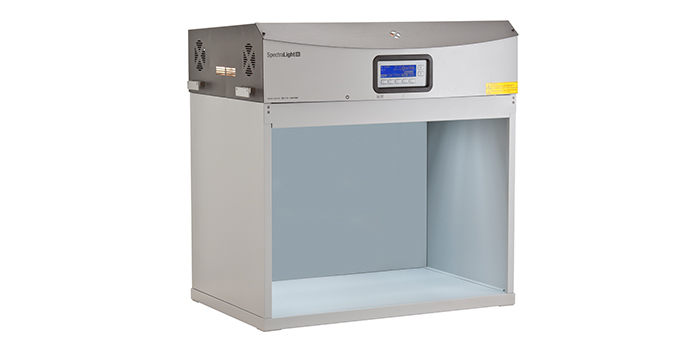 The SpectraLight QC light booth features seven light sources, more than any other light booth on the market. This includes Daylight, Incandescent “A,” Horizon, three fluorescents (choice of any combination of CWF, U30, U35, and TL84), and UVA. Profiles can be created to share preferences and settings across the supply chain. Filtered tungsten halogen daylight simulation provides the most accurate rendering of daylight available anywhere in the market for optimum visual assessment. After initial power-up, lamps achieve almost instant stability when switching between lamps. A helpful indicator acknowledges optimum stability to assure operators that it is in top condition. Every instrument starts with exacting UV calibration. Built-in sensors monitor and correct UV output to maintain inter-instrument agreement. Built-in sensors automatically adjust voltage to maintain proper lux, compensating for lamp age and wear. Real-time digital lux output can be adjusted to comply with ASTM and AATCC standards for sample type or user needs. Certified replacement lamps allow for consistent performance and better traceability. Lighting is one of the most critical influencers of accurate color evaluation. By using the SpectraLight QC light booth during the design, specification, pre-production, production and quality assurance stages, color can be accurately evaluated under all relevant lighting conditions. This acts to reduce human error and waste due to rejects and rework, shorten time to market and improve overall product quality. The system also includes value-added training programs through the X-Rite Visual QC Institute.